A viral infection can affect anyone. If your symptoms last longer than two weeks, or they're particularly severe, our experienced doctors can help you get back to normal as quickly as possible. You can speak to a GP from the comfort of your own, without worrying about infecting others. Our doctors are experienced in identifying and treating a wide range of common viral infections. If you have a virus, the last thing you want to do is leave the house. With Push Doctor, you can see a doctor on your smartphone, tablet or computer in minutes and get the help you need. The common cold will likely cause a blocked or runny nose, cough and sore throat. Most of us will have suffered from a cold at some point. The best treatment is rest, while you should also ensure you drink plenty of water. Flu causes similar symptoms to a cold, but these come on very quickly and can also include headaches and fever. 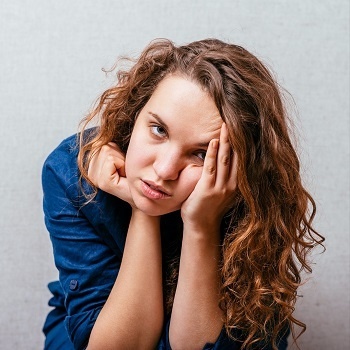 You might also feel very tired and unable to go into work or carry out everyday tasks. While flu will go away with rest, there is a vaccination available for at-risk sufferers, such as the elderly. This is given once a year, due to the fact that the viruses that cause flu are constantly evolving. There is also the possibility that flu in at-risk patients can lead to the more serious pneumonia, so it’s best to keep a close eye on any symptoms and speak to a doctor if you have any doubts. 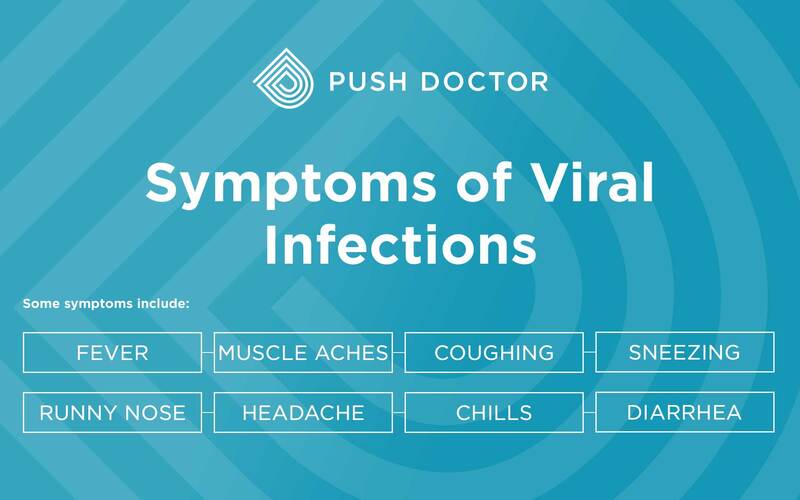 Many viral infections have similar symptoms, so if you're not sure what you have, our doctors can help you work it out. If you suffer from cold sores, you will usually know when one is on its way due to a tingling sensation around your lips. A cold sore is a blister, or collection of blisters, around the lips. Some people find cold sores embarrassing due to the fact they are very difficult to conceal. As well as being passed on by touch, cold sores can also be triggered by factors such as stress, fever or tiredness. They will go away on their own, while there are also antiviral creams available that will speed this up. Most common in children, you are likely to only ever get chickenpox once. The main symptom is itchy, red spots all over the body. For this to go away, the spots will need to blister and then heal over. It’s important not to scratch these spots, as this will slow the healing process and in some cases lead to scarring. There are lotions and gels available that will help soothe the itching, but make sure you choose a suitable product that won’t make the rash worse. This features similar symptoms to chickenpox, although the rash is limited to one side of the body and can be painful. However, unlike chickenpox, shingles is not contagious. The MMR vaccine has made these viral infections much less common in the UK. In most cases, they will pass on their own within a week to 10 days in any case. Measles gives you a red rash that usually begins in the head or neck area, while you will also experience symptoms similar to a cold. Mumps often results in swollen glands, aches and pains and fever. While a swollen face is the most recognisable symptom, it actually only occurs in two thirds of cases. Rubella (German measles) features some elements of both, with a red rash often joined by symptoms such as fever and fatigue. Commonly known as the ‘winter vomiting bug’, norovirus is a form of gastroenteritis that results in symptoms such as diarrhoea, vomiting and stomach ache. The most common form of hepatitis in the UK, it is primarily passed on through contact with infected blood or sharing needles. Hepatitis causes inflammation of the liver and causes symptoms such as joint pain, fever, nausea and in more serious cases, pale, grey stools and jaundice. If you think you might have hepatitis C, it’s vital to speak to a doctor as soon as possible. Unlike other forms of hepatitis, there is currently no vaccine available, but there are antiviral medications that will manage the symptoms. Meningitis can be caused by a virus or bacteria. Generally, bacterial meningitis is much more serious and the viral form will clear up on its own, but you might want to seek clarification about which form of meningitis you have. Symptoms tend to include a fever, headache, stiff limbs and sensitivity to light. You might also develop a rash that does not disappear when pressed under a glass tumbler, but it’s important to note that this does not occur in all meningitis patients. Most viruses will clear up within a week to 10 days. In most cases, a doctor will be able to suggest the best medicines to manage this. These will depend on the type of virus you have - for example, if you’re suffering from a cold, you might require a decongestant. Viruses can have a more severe effect on some patients. Extra caution should be taken with the elderly and those who are already being treated for a separate illness. A consultation with a doctor will help identify potential problems and put your mind at rest. Even if you're generally healthy, if your symptoms don’t go away after two weeks, or become particularly intense, you should speak to a doctor as soon as possible to rule out anything more serious. As viruses are contagious, they are usually passed on through things like coughs and sneezes. You can also catch one from touching a surface that an infected person has touched, or in some cases, if you come into contact with that person’s skin or blood. Contaminated food is another way viruses are spread. For example, an infected person may have breathed, coughed or sneezed near your meal, or the person preparing it might not have washed their hands properly. There are many different kinds of virus, so it’s helpful to find out which one you have in order to get the most effective treatment. When it comes to preventing the spread of viruses, this can be very difficult as symptoms often don’t present themselves until a few days after you have actually been infected. However, once you know you have a virus, it’s best to avoid other people until a couple of days after your symptoms have stopped, in order to avoid passing it on. General good hygiene practices such as washing your hands and using a tissue or handkerchief when coughing and sneezing will also help prevent the spread of viruses.